308 pages | 26 B/W Illus. Body and space refer to vital and interrelated dimensions in the experience of sounds and music. Sounds have an overwhelming impact on feelings of bodily presence and inform us about the space we experience. Even in situations where visual information is artificial or blurred, such as in virtual environments or certain genres of film and computer games, sounds may shape our perceptions and lead to surprising new experiences. 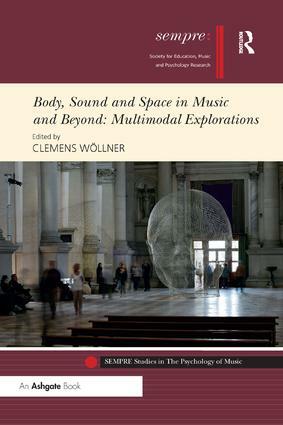 This book discusses recent developments in a range of interdisciplinary fields, taking into account the rapidly changing ways of experiencing sounds and music, the consequences for how we engage with sonic events in daily life and the technological advancements that offer insights into state-of-the-art methods and future perspectives. Topics range from the pleasures of being locked into the beat of the music, perception–action coupling and bodily resonance, and affordances of musical instruments, to neural processing and cross-modal experiences of space and pitch. Applications of these findings are discussed for movement sonification, room acoustics, networked performance, and for the spatial coordination of movements in dance, computer gaming and interactive artistic installations. Clemens Wöllner is Professor of Systematic Musicology at the University of Hamburg, Germany. His research focuses on performance, multimodal perception and the acquisition of expert skills, employing a range of interdisciplinary methods including motion capture, eye-tracking and physiological measures. He has published widely on topics related to musical conducting, perception–action coupling, human movement, imagery and attention in pianists, empathy and research reflexivity. The theme for the series is the psychology of music, broadly defined. Topics include (i) musical development at different ages, (ii) exceptional musical development in the context of special educational needs, (iii) musical cognition and context, (iv) culture, mind and music, (v) micro to macro perspectives on the impact of music on the individual (from neurological studies through to social psychology), (vi) the development of advanced performance skills and (vii) affective perspectives on musical learning. The series presents the implications of research findings for a wide readership, including user-groups (music teachers, policy makers, parents) as well as the international academic and research communities. This expansive embrace, in terms of both subject matter and intended audience (drawing on basic and applied research from across the globe), is the distinguishing feature of the series, and it serves SEMPRE’s distinctive mission, which is to promote and ensure coherent and symbiotic links between education, music and psychology research.